Description: Don’t be fooled by her delicately coiffed hair, the musketeer is a mean shot with her trusty boomstick. The Musketeer is a very long rang(6.5 tiles) cannon shooter. She works best with a front line tank of either the Giant, Giant Skeleton or Knight to spearhead an attack. She does have low health points and needs to be protected. She is also a specialist against air units. Keep in mind the Musketeer doesn’t get distracted once she locks on a target. Also, if you want a ranged alternative to the Archers, Musketeer is a good option. Musketeer + Giant – A good combo at 9 elixir cost. Your musketeer is able to DPS from behind while your giant tanks any incoming melee damage. This can be countered by directly dropping melee troops on the Musketeer, but only if they are within your base. Musketeer + Knight – A slightly weaker version at 7 elixir cost. Knight is less tanky and dies quicker, but it is still a viable combo. Musketeer + Giant Skeleton – Great troop clearer and will give you an upper hand in having a strong push. It does cost a whooping 10 elixir though. Musketeer + Small Troop Rush – A good combo for lower level arena. It does a lot of damage once you can stack up a wave of small troops. This is easily countered by Arrows. 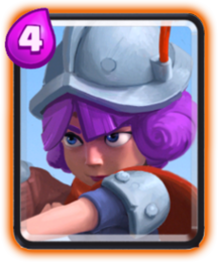 Musketeer + Prince – With Musketeer’s long range, she has no problem keeping up with the fast Prince. A definite tower destroying combo. Mini PEKKA – Drop one of these bad boys on top of her if she enters your base. Fireball – This almost takes out the Musketeer, depending on your fireball level. For 3 elixir cost, its a great trade.